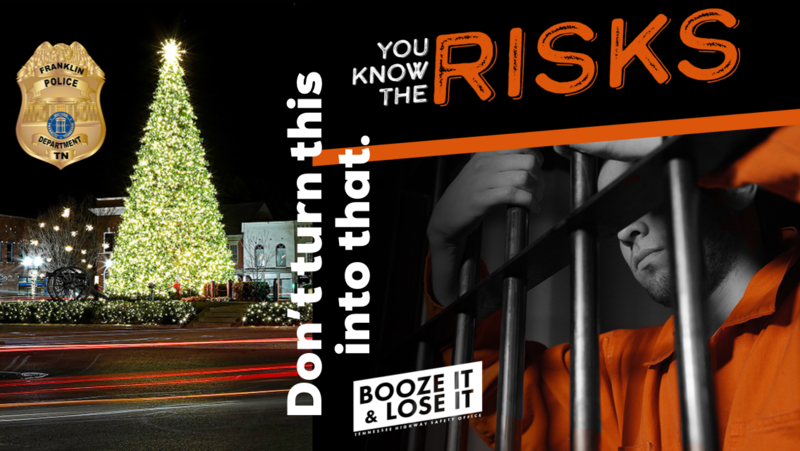 Christmas should be about green & red … not orange; Booze It & Lose It! Extra Franklin Police Officers begin hitting the street tonight to help protect you this weekend & throughout the Christmas holiday. Officers will be working overtime to focus on impaired, distracted, and dangerous drivers. The Tennessee Highway Safety Office is funding that overtime in an effort to help keep motorists in Franklin and throughout Tennessee safe. Alcohol is sure to be served at many of this weekend’s holiday gatherings. If you plan to drink, be sure that a designated driver is part of your plan as well. If you drive impaired – you will be arrested, you will go to jail.